It doesn’t matter if you’re just getting into biking, you’re a seasoned veteran of the sport, or somewhere in between, you’re going to need to find a top-notch bike shop for new wheels, new gear, and repairs. New Mexico’s great bike shops offer the best selection of product and are run by experts in the field. Here are the 10 best in the state. Great bike mechanics make for a great bike store. The owners of this store are just that. They’re also avid cyclists so they know how to keep a biked tuned for a great ride, from road to mountain to cross-country to BMX. The shop is small, but compact, full of components, parts and accessories that are actually useful. A casual, laid back vibe where you can have an espresso or a beer while you hang out. This is a full-service bike shop. 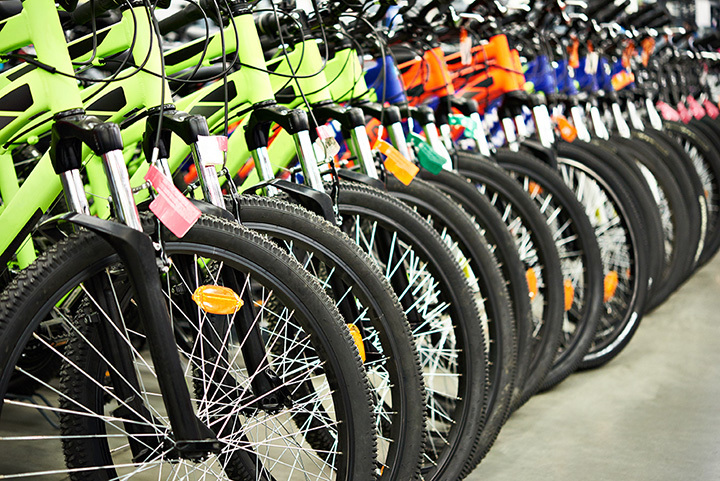 You’ll find a huge selection of Specialized and Fit BMX bikes and an extensive inventory of bike parts and accessories. They have mechanics on-site six days a week so if your bike is broken they can fix it. And they can rent you one if you need that too. They take trade-ins as a community service. Locally-owned and committed to providing great customer service. Two people, two different sports activities, one perspective—to join the best of both sports, running and cycling, under one roof. This bike side of things features apparel, parts, accessories and nutritional products from well-known makers like Chris King, Pearl Izumi, Fox, Shimano and GU. Top-notch bike maintenance ser-vices on-site with three packages to choose from. Looking to get the most out of bike experience? You’ll find the answers here. Gear … everywhere, on the walls, hanging from the ceiling, stacked around the store. This is a place for gear heads. They sell mostly Trek bikes, but also have parts and accessories from the likes of Moots, Santa Cruz, Yeti and Raleigh, and that’s just what you see at first glance. When it comes to repairs, bring your high-end bike or big box store special. They’re not picky, they just want you back in the saddle. Free quote to get things going. Lots of local information on best trails and rides around the area. Santa Fe spoke and put this in the top of the Reporters’ Best of Santa Fe last year. There’s something for everyone here—town cruisers, sturdy mountain bikes, stylish road bikes, slick cyclocross, full suspension and custom built bikes. Repair services run the gamut from basic to a razzle dazzle tune-up. A great place to rent a bike for an hour, a day or the weekend. Ask them about the best spots to pedal and you’ll get route advice, maps and a little philosophy on the road less traveled. For more than 40 years, the wheels have been spinning at this locally-owned and operated shop, providing bike sales, service, rentals and expertise to the cycling community. If you’re looking for a new bike, they’ll make sure you get the style and fit you need. Every new bike comes with a year of free adjustments because they want you keep riding! A wide-ranging selection of equipment from an eclectic assortment of manufacturers. The shop’s the go to place for info on local rides, trails and club rides that won’t pass you by. The shop hosts one on Sunday mornings, an easy to intermediate road ride. Comfort is everything when it comes to being on a bike. If your bike doesn’t fit you, it’s likely you won’t ride it. The bike gurus here know that, so they have a certified fit expert on staff to make sure that when you buy a bike you’ll end up loving riding as much as they do. And they can fix them. too. There’s a full-service repair shop and experienced mechanics in the shop six days-a-week. Rentals available. New Mexico State University students get a 10 percent discount on bicycle parts and accessories. Mountain and road biking in the Sangre de Cristo Mountains is not for the weak-kneed. At almost 7,000 feet, the ups-and-downs of the dirt terrain and steep highways are a test for both bike and rider. The knowledgeable staff here can help make the experience successful. You’ll find a range of road, mountain, BMX and cruisers and other necessary cycling paraphernalia for a fun and safe ride. There’s a professional repair shop, for quick adjustments or more extensive tune-ups; all work is guaranteed. Stop by and get the local scoop on all the best riding spots. Steve, the owner, has been the smile behind this happy place for close to 40 years. He believes in providing hometown service with, of course, a smile. He operates a full-service bicycle repair center, sells both new and pre-owned bicycles, as well as an extensive inventory of parts and accessories. He’ll rent you a bike by the hour, week or month. If you’re just thinking about clicking into some pedals and starting to ride, he has a huge inventory of bikes on consignment at reasonable prices. Two guys opened a bike shop 30 plus years ago and it’s still going strong. They know bikes, bike gear, bike routes, bike lore, bike trivia … well, you get the idea. These are the kind of bike guys that have the know how to fix, advise or recom-mend what’s in your best bike interest. They’re the hub of local information for events and races and clubs and advocacy. A good selection of brands for frames, which they’ll build to your specifications. Check out the E-bikes—a little extra power never hurts.